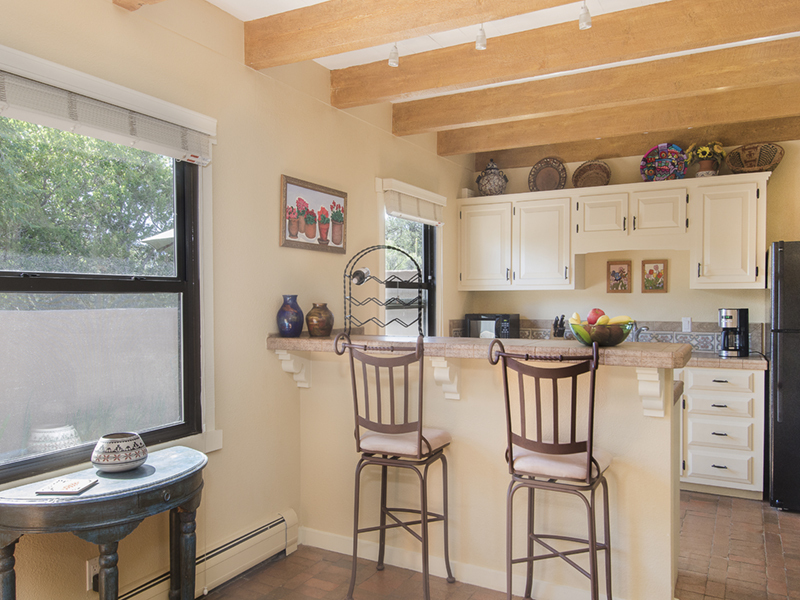 Just a short drive north of the Plaza, you will find the charming Placita de la Vista located in the popular North Hill Compound. 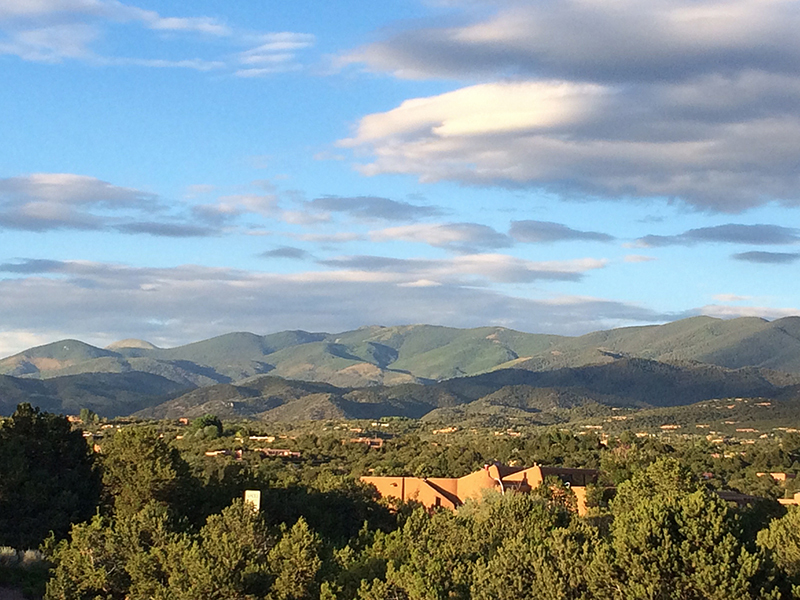 This is a two bedroom, two bath condo with lovely views of the mountains. Park in front of the walled patio and enter the gate to a private, flagstone patio with dining table and market umbrella. There is a grill as well as a chiminea for the chilly Santa Fe evening! From the patio, you enter into the open entry and kitchen with traditional brick floors, beamed ceilings and custom tile. 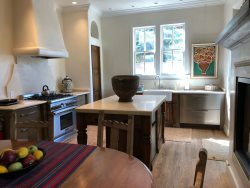 You can enjoy breakfast at the kitchen counter or have a meal around the beautiful dining table adjacent to the living area with kiva fireplace. The comfy open living room has a large sofa and two leather chairs where you can enjoy watching TV or reading a good book. The two bedrooms are private from one another. The master suite has a king bed, bath, TV and large walk-in closet. The guest bedroom is appointed with twins but with notice, the bedding can be converted to a king. There is a bath with small walk in shower in the hall. 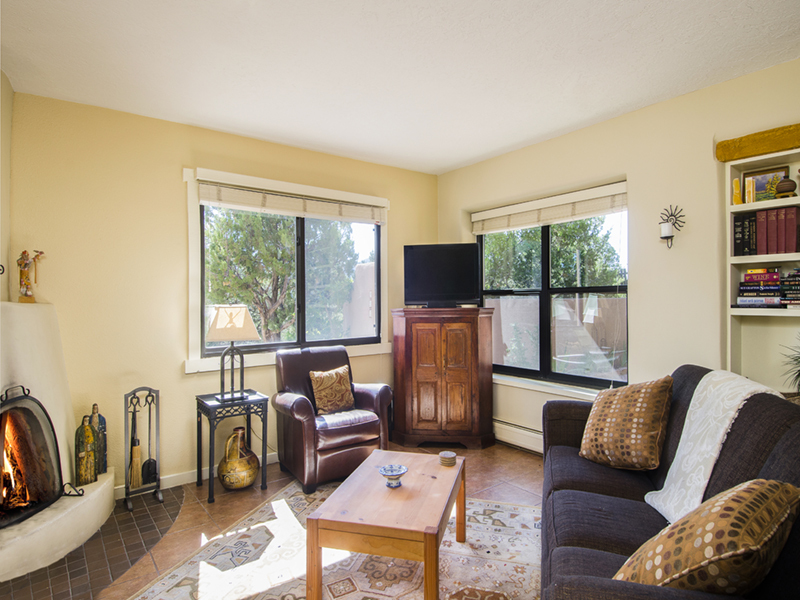 The mountain views are wonderful from this location and well as the close proximity to downtown. This is a no-pet property. The home is equipped with evaporative cooling. Elaine was very friendly, answered all my questions and got me all the info I needed very quickly. I loved the property. It was clean, very easy to find and in a terrific location for accessing the ski area. The only thing I would change is have keypad entry to prevent picking up and dropping off keys. This also keeps the tenant from having the opportunity to lose keys while out and about. Cosy and easy access to the plaza.